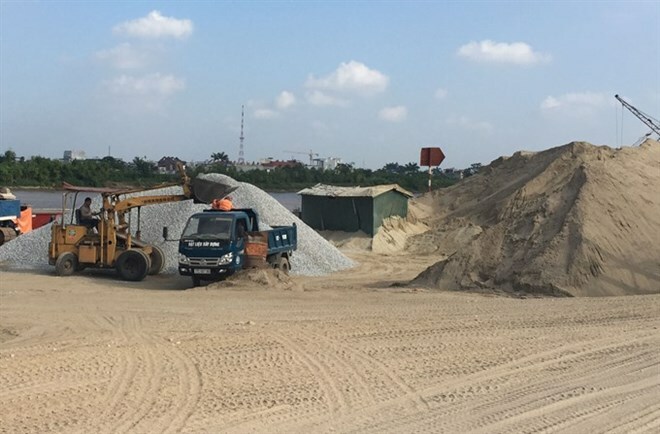 HCM City (VNA) - With demand for sand for construction rising even as prices are skyrocketing, Deputy Prime Minister Trinh Dinh Dung has recommended the use of other materials in construction in place of natural sand. The huge demand for sand and its rising prices have seriously affected many major construction works such as the Trung Luong – My Thuan (in Tien Giang province) Highway, a section of National Highway No 60 in Ben Tre province and Lo Te - Rach Soi Road in Kien Giang province. The contractors of these works said the rising sand prices have caused construction costs to balloon and even the suspension of some of them. Speaking at a recent conference on investment in infrastructure development in the Mekong Delta, Deputy PM Dung called on the ministry to co-ordinate with provincial authorities to improve management of sand mining in rivers, estuaries and channels in the region. Sand exploitation must be linked with the protection of river banks and the coast from erosion, he said. He also instructed the ministry to cooperate with relevant agencies and find other materials to replace natural sand in transportation infrastructure projects in the country in general and in the Mekong Delta in particular. In response to Dung’s instructions, the ministry has called on provincial and city authorities and other relevant agencies to use natural sand effectively and use artificial (or crushed stone) sand to replace traditional sand for making concrete, and to use other materials instead of sand for ground levelling. Iron and steel slag can be used as construction materials to replace traditional sand, according to the ministry. Dr To Van Thanh, deputy director of the Southern Institute of Water Resources Research, said most of the rivers flowing from other countries into Vietnam have hydro-power plants in their upper sections, which obstruct the flow of water and silt carried by these rivers. This is reducing the volume of sand carried to the lower sections of the rivers, causing ecological imbalances and sand shortages, he said. Tran Van Mien, head of the construction materials department at HCM City Polytechnic University, said a mixture of crushed stone and traditional sand in various ratios would meet construction standards. The cost of crushed stone is only half of that of traditional sand in the market, he pointed out. Experts have also noted the use of slag from thermal power plants. They said in many countries around the world, slag has been used for decades to produce sand. The 19 thermal power plants in Vietnam produce some 20 million tonnes of slag every year, but half of the volume has not been utilised efficiently. In Japan and China, mud dredged from canals is used to produce sand, and money has been invested in plants to produce mud, which is used to produce artificial sand. The Mekong Delta has huge resources of this mud, they said. The Southern Institute of Water Resources Research’s Lab for New Materials Research has done studies into producing sand for construction from mud dredged from rivers and canals. Experts also said relevant agencies should strengthen management of sand mining and come up with sound policies for the exploitation of natural sand.